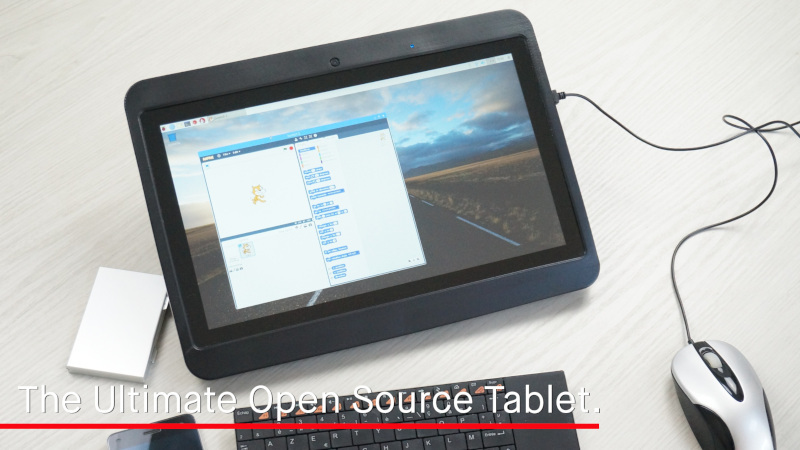 All the Open Source in one device. The project has attracted a lot of interest and specialist press articles since 2017. A prototype was already funded last year by Ulule. This article tells how the idea grew and developed into today's crowdfunding. The idea of the Diskio Pi came to me in 2015, with the purchase of an Orange Pi board (SoC A20). The novelty of the time was the possibility to install Android, something impossible on Raspberry Pi (1) B. But the proposed Android didn't handle touch, I had to compile the sources myself. The first prototype, in 17", was big enough for me to insert all the boards and batteries. It was from the second prototype that the size of 13'3 was chosen. But the too thick design of this version 2 was to be reviewed, as well as its price. It is therefore this third prototype that is currently being proposed, still in 13'3. Unfortunately, all parts will be manufactured in China (except perhaps the packaging), a prerequisite for offering an acceptable selling price. The name Diskio (δισκίο)comes from the modern Greek word "tablet" in English.) comes from the modern Greek word "tablet" in English. Later, I realized that it could be interpreted as disk I/O, and it fits the project well ! The logo was quickly found thanks to an online logo generator. Don't bother with that. Basically, a hexagon (like France map) with squares representing the different compatible machines. Many of you are curious to know how I managed to make the prototypes. In this article, I try to briefly explain the main stages of development. There are many online vendors who offer display controller boards. By noting the reference of the screen, it’s easy to find the corresponding boards. Then, the most appropriate one is chosen, depending on the project and the type of video input desired. In general, it is VGA, sometimes HDMI or DVI. The salespeople are usually very cooperative and will help you. Do not hesitate to write to them for details and advices. The principle of this prototype is the same as on the last one: a general power supply, a buck that converts 12V (or 9V) to 5V, batteries that charge to 12V and deliver 5V. All this with a powered HUB and the video board, itself connected to the PC board via HDMI (here, we have an extra VGA stage). For the battery, an external battery for laptop dismantled is fine. Be careful with the PCB balance so as not to create short circuits! LiPos are quite sensitive, and can catch fire. The idea of the mouse dismounted for the home button was abandoned on prototype 0.3. There is one of the two brackets of the screen, the screen board (HDMI this time, the VGA connector being unsoldered), and a drawer with a backplane connector. This idea was also abandoned for economic reasons. Same thing for the audio amp, the screen board has an integrated amp, why not use it? This has been done on prototype 3. This prototype suffered from a thickness that was too visible and a design that was too massive. It was necessary to start from scratch to imagine the third prototype. etc. It is in a way a reverse engineering work that I applied to plastics processing, in addition to the advice of Chinese suppliers (who are ready to do anything to help and win a potential market). For the CAD, each part is modeled with 1/10 mm accuracy. Electronic boards and their main components are also modeled. The result is a virtual assembly that must be manipulated and visualized from all angles, without forgetting anything. And it takes a long time. All options should be thought in advance, and if possible options that are not thought out. That's why I placed 4 PCB screwing pads above the L board, to have all the available surface area "just in case". The CAD was then sent to a plasturgist in China for manufacture. To save as much as possible, I chose to make it in white ABS, and then paint it with acrylic paint. Placing the elements on the framework went as planned, despite deformation of the parts due to heat during transport (it was in June). After a short hot water bath of the deformed parts, the first assembly worked the first time. The daughter board had to be pre-prototyped before being manufactured in its own right. The electronics engineer took care of the welds and the first tests before sending it to me. So I made the final adjustments and replaced some component values to get what I wanted. Then, I ordered the corrected PCBs and soldered the final prototype board (exceptsome CMS components, which were not equipped). For the mechanical side, the main one worked. The hinge to close the cover is very practical, it can be opened and closed quickly with 3 screws. The removable and reversible stand is also functional, although an improvement will have to be made to remove it by hand, and to allow the GPIO tablecloth to pass through (see below). However, the clips on the side did not work. I have to tilt them to apply a spring effect, and enlarge the hooks. All this without it being too fragile. Some other details need to be improved, such as the fixing of the Raspberry Pi plate on the main frame. In general, I wasn't too wrong. battery supplier also has some merit because we spent a lot of time and dozens of emails before I ordered 5 packs with PCM board... But so that in the end the batteries are the right size and with a very correct capacity. When it comes to traps when drawing, it's always wanting lots of features, and sometimes it's limitless. You have to try to balance ergonomics and economy, because sometimes it is feasible but too expensive, or it prevents another feature from working properly. Nevertheless, we must think of all the eventualities, a little bit when programming a script: if we multiply the functionalities, we must also multiply the eventualities of use. The final product will be a kit, with all the parts needed to manufacture a 13'3" high definition touch screen, compatible with nano PC boards such as Raspberry Pi or Odroid. The kit will be composed of boards already populated, no soldering will be necessary for the assembly. Potential buyers already know the development boards, so they are able to assemble their own devices. It is also a game for some of us! For a paradigm shift. We all know that most disboarded electronic products pollute. If the user knows how to assemble a device, he will be able to dismantle it, and thus repair it more easily if an element is damaged. Therefore, only the element that is obsolete or broken is replaced. In order to save money: the assembly of our devices has a cost, which would then be saved (although partially offset by packaging). 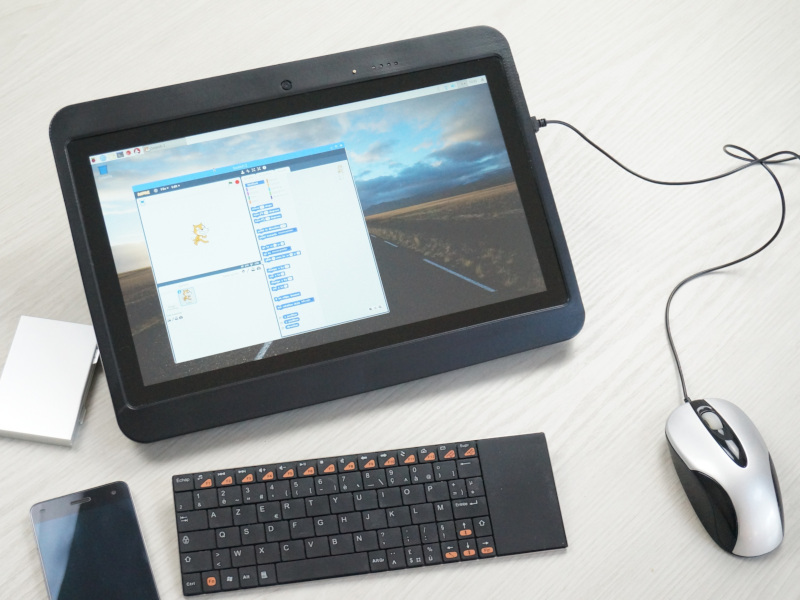 The final device will therefore be a desktop-tablet hybrid, ready to accommodate Raspberry Pi 1/2/3 B/B+ or Zero, but also Odroids C1+/C2/XU4. Any other board with the Raspberry Pi form factor is also compatible, if its power supply does not exceed 5V and 4A. 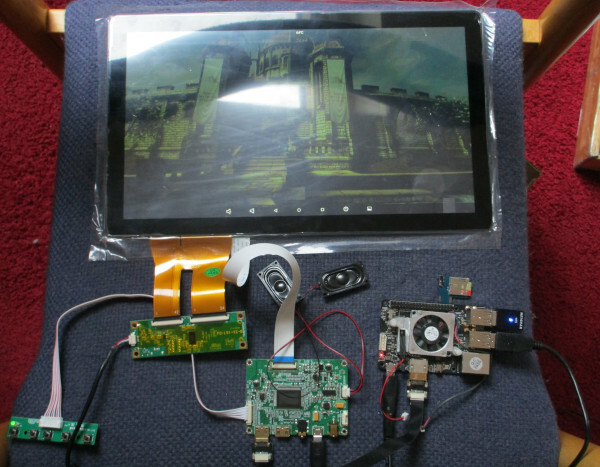 The Diskio Pi can also be used as an independent display for a laptop or game console, with a resolution of 1920x1080. The assembly will not require any special knowledge, no welding (except in extreme cases), no glue. You will need a pair of scissors, a cutter and tape. The kit will be delivered with a small screwdriver and a double-sided roller for the assembly of the screen (composed of the screen itself and the touch glass). The gluing of the screen will be precise, as it is guided by the placement of the plastic frame on the frame. If necessary, you will need a mini drill for the VESA options (coming soon) and to place the OSD buttons at the front: useful if the device is recessed. An accurate assembly booklet will help you through all assembly steps, with supporting diagrams (at LEGO). Each cable has a different coding for added security. For example, 9V, 7.4V and 5V power supplies will have a different connector. Here, we see 2 battery packs. Each pack being composed of 2 cells, the 4 cell version will be composed of 2 packs, and the 6 cell version of 3 packs. The question of Open Source did not arise, it is the cornerstone of the project. For a hardware development like this one, you have to make do with what you have. Being neither a training software developer nor an electronics engineer, while searching on the Internet I learned and found many things. Then, it requires funds to have everything studied from A to Z. This is why some boards are purchased ready-made (screen controller, touch controller), and are not open source. The community is free to improve, propose, manufacture. For the case, its complexity does not allow it to be printed in 3D. 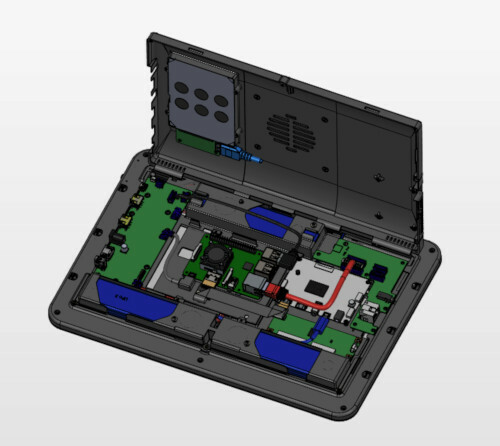 Only the internal parts (the screen brackets and the nano PC board support plate) will be printed, and it will be possible to download and print special trays to adapt exotic boards. 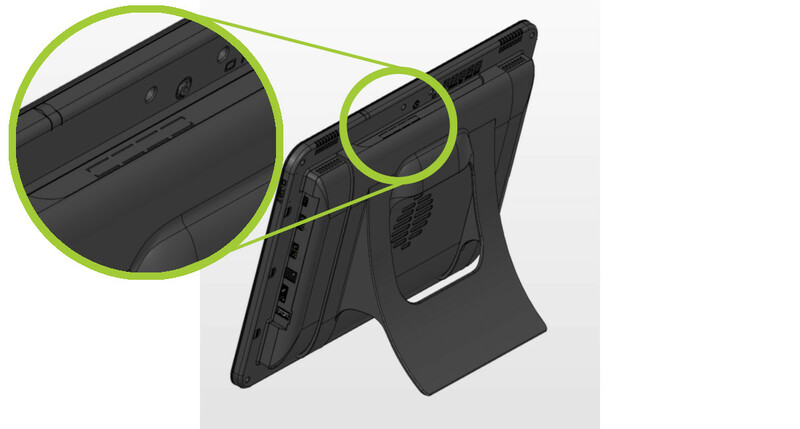 The brackets are removable, to allow greater screen compatibility, in case the original reference is no longer manufactured and all stocks are exhausted. The community will then be able to exchange its files and propose new versions. As for the internal cables, I used very common connector references (JST) so that the equipped user could manufacture his own cables. The basic version will be delivered with all cables to adapt all Raspberry Pi models (except the compute module), as well as the Odroid C1+ and C2. For XU4 and UP Board boards, other cables are to be expected: either buy them on the website www.diskiopi.com for a few euros, or manufacture them yourself with the connector references I would make available. connected to the motherboard via USB 3.0 - the removable part can also be replaced, to allow the antennas to leave the case. But this L board could also be an audio amplifier, an RS232 board, or a video output! Of course, each board will have to be studied individually, which will take time and require funding. The idea is that this L board is the equivalent of a PCIe board on a classic PC. 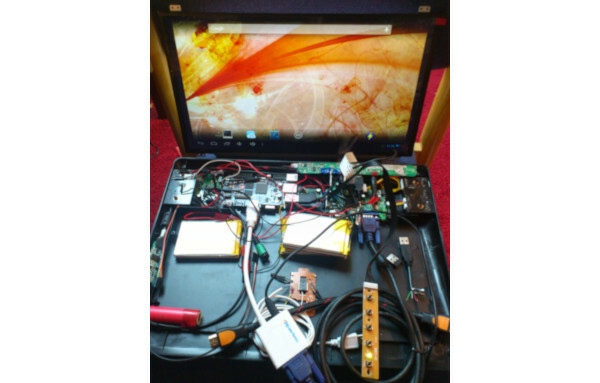 The Diskio Pi project is 100% hardware. No proprietary software is required to run it. All Raspberry Pi distributions are therefore installable, even if some (Recalbox for example) are not compiled with touch drivers. For the moment, only one distribution is ready to work in touch "out of the box": it is LibreElec (download to come). For the others, whether it's Raspbian or Ubuntu, the drivers are pre-compiled, there's nothing more to do than choose the most recent kernel. The Android versions distributed by Hardkernel (Odroid) are fully compatible with touch. When designing the project, we chose to completely separate hardware and software. This has advantages, but also disadvantages. For example, in the battery gauge: the advantage is that it works all the time with all OSes; the disadvantage is that it cannot display the battery icon on the screen. It is of course possible to provide a connector on the charger/balance PCB to the Raspberry board, and to communicate via I2C. The problem is that it will be necessary to add cables, and especially to develop (or adapt) a software in Raspbian. A software development under Android will also have to be carried out. I finally solved this problem that had been bothering me for months! I have indeed thought long and hard about making the GPIO spindles accessible. A tablecloth can easily be flexible on its axis, but not laterally, making it impossible to access outside the board axis. Proof that the simplest solution is sometimes the one you don't think about: a pre-cut on the top of the housing in the axis of the GPIO (Raspberry Pi 3) will be added, it will have to be cut with a cutter (without cutting your finger) to insert an IDE type cloth. This involves modifying the design of the stand by opening the upper part. In addition to this notch to allow the GPIO tablecloth to pass through, another modification will be necessary to easily remove the stand from its lugs. To do this, I added two fingerprints on each side of the pin so that I could leverage with my fingers and detach each "strap". I hadn't thought at all about how to remove the stand! It has been done. As you can see, there is still a lot of room for improvement. That's why the delivery time is for August 1019, the time to manufacture two more prototypes, test them and validate all the features. My passion for computers goes back a long way (yes). My first user experience was around an Amstrad 464 cassette, where you had to wait a good 5 minutes (sometimes 10) before you could see the menu of a game appear. The floppy drive changed things, but it wasn't until after the Amiga 500 came along that everything started. At that time I was already starting to use 3D software while waiting for one night to see the rendering of my drawing appear... A lot of mythical games have been played on my screen: Dune II, Xenon II, the Gobliiins series, and so on. In short, I've been a gambler since childhood, but not only that. Tinkering with a SCART socket to finally adapt the Amiga to the TV, I did. And it was working! Personally, I have never been equipped with a touch pad. Too closed, no freedom. There is nothing that can satisfy my desire for change with a classic device. And I think there are many of us in this case: who want material that can be controlled and that can really meet our expectations. If you're like that, then Diskio Pi is for you. Sometimes a screen, sometimes a tablet, sometimes a desktop. The choice of use in a single device is useful. The playful and educational side of Diskio Pi In France, IT innovation since MO5 and minitel is almost non-existent. It is time to react. It is a long-term challenge, and an expensive initial investment for an institution, but one that would be profitable for everyone, and that would address various topics related to IT in general. One can even imagine providing a Raspberry Pi Zero to each student when they enter fourth grade, which they would connect to a Diskio Pi in the school for practical work, and take home. For the software side, Primtux is already available on Raspberry Pi. Financing a project also means investing for the future It is often thought that crowdfunding sites such as Kickstarter are only used to sell a product. But it is much more than that. As an investor, if you believe in the project, you are a direct actor in its development. The power is on your side. In addition, you give it visibility and the chance to succeed. Without you, the project dies and the idea stays in a box. That's why even a donation of 5€ for a free project is important! Thank you for taking the time to read this article, and I hope to see you soon. My name is Guillaume Debray, I have a BTS in optical eyewear. I didn't develop with the optician's profession, that's why I stopped everything to devote myself first to travel, then to IT, my lifelong passion. 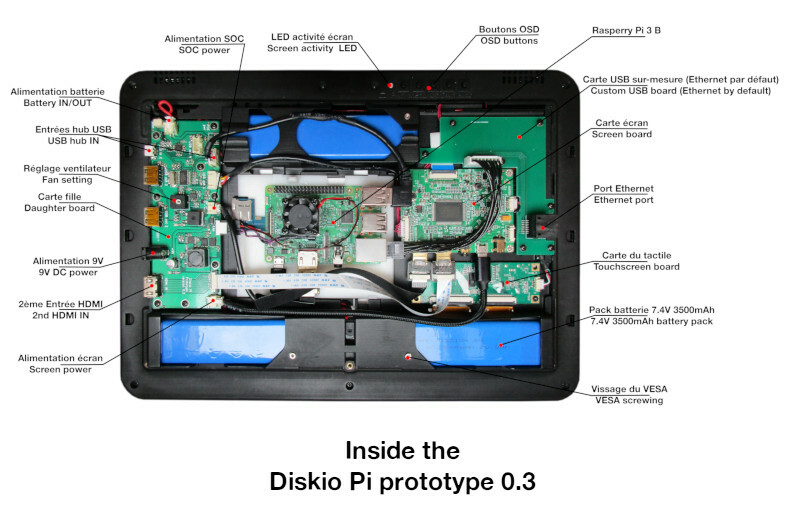 I have been working full time on the Diskio Pi project for about two years. I learned about python by offering Dpluzz+, an open-source software for downloading television programs. I put this project aside to devote myself fully to Diskio Pi. In the course of the project, Benjamin offered to help me draw version 3, but his company taking up a lot of his time, he agreed to let me set up all the crowdfunding. It therefore remains in the background for the time being. All electronic engineering is carried out by Nicolas Macé, from Mace Robotics. His knowledge of Raspberry Pi is very useful to the project, and he will continue to develop the boards for Diskio Pi.